Hundreds of thousands of South Koreans took to the streets in Seoul demanding President Park Geun-hye‘s immediate resignation on November 19. This protest was the fourth in a series of weekly mass demonstrations since October when it was first reported that Park was being secretly advised by Choi Soon-sil, a friend of 40 years who holds no official government title. The scandal involving Park’s cronyism and corruption has triggered the worst political crisis in South Korea in decades. The biggest demonstration so far took place on November 12, when about 1 million people gathered in central Seoul. This was the largest anti-government protest since the June 1987 democracy movement when South Koreans forced the military regime to hold a free presidential election and eventually paved the way to ending the dictatorship. The friendship between Park and her confidante Choi Soon-sil dates back to the 1970s when Park first met Choi’s father, the founder of a religious cult who was believed to have become Park’s mentor and exercised cult-like control over Park until his death in 1994. Choi is suspected of using her close ties to Park to pressure large corporations, the so-called “chaebol,” to donate nearly 77.4-billion won (about $70-million) to two foundations she runs. She is also suspected of meddling in state affairs and government decisions on personnel and policy behind the scenes, while gaining unauthorized access to classified information. Choi has been charged with abuse of power and fraud. Two of Park’s aides have also been charged with abuse of power and extortion, and are suspected of helping Choi extract huge sums of money from big businesses, including Samsung, which alone is reported to have given $20-million to Choi in return for a favor. Initially, the corruption scandal was dubbed as “Choi-gate” and public anger was directed mainly by the “shadow president” – implying that Choi exercised an undue influence over Park and used her personal connection to coerce businesses into donating money to her foundations, amass an illicit fortune and win favors for herself and her family. The allegations of corruption, abuse of power, embezzlement and cronyism stirred public anger and outcry for Park’s resignation or impeachment. Park’s approval ratings have plummeted to 5 per cent, the lowest in the history of South Korea. In an attempt to defuse public fury, Park initially vowed that she would cooperate with the investigation into any possible fraud and embezzlement involving her friend. But on November 20, after the release of the prosecution’s indictment of Choi, Park indicated through her attorney that she would not answer any of the prosecution’s questions. Moreover, according to an insider, when she was advised to step down to quell a wave of popular fury, she allegedly responded by saying, “What did I do wrong?” – signaling that she wasn’t willing to hear the voices of the people and would hold out no matter what until her five-year term ends at the end of 2017. This arrogance has fueled more public anger against Park. It’s expected that more people will participate in the next scheduled mass protest this coming Saturday demanding her resignation. While people in the streets are demanding Park’s immediate resignation, opposition parties, though emboldened by the massive protests, have yet to seriously push for Park’s resignation over fears of negatively impacting next year’s presidential election. It seems that what they’re most interested in is containing people’s anger and channeling it into their electoral victory next year. 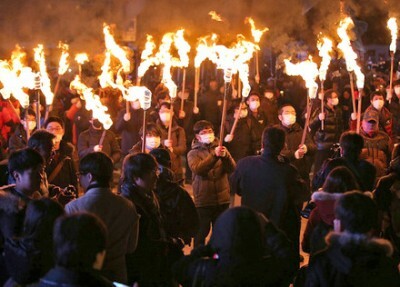 South Koreans are angry over the corruption involving Park and those around her. But that isn’t the only reason there’s such huge outcry. When she became South Korea’s first female present in 2013, Park promised sweeping economic reforms to bridge the growing income inequality between rich and poor and address unemployment and a stagnant economy. She said that she would help the country repeat the so-called “Miracle on the Han River” – a reference to the rapid economic development seen under her father’s presidency. Park promised to create jobs and build a “creative” economy that would be less dependent on South Korea’s dominant big businesses, called “chaebol,” and would bring about “economic democratization” by prioritizing job creation in science and technology. During the last four years, however, she has demonstrated her heavy-handed leadership style and lack of transparency, which very much resembles her father’s authoritarian rule. Just like her father, under Park’s presidency, attacks on workers’ rights, working conditions and wages have intensified, and a ruthless crackdown on dissent has continued. For example, Han Sang-gyun, president of South Korea’s independent Korean Confederation of Trade Unions (KCTU), was arrested last year and is still in prison after being sentenced to five years imprisonment for organizing a series of demonstrations against the Park administration. Moreover, in an attempt to glorifying her father’s military dictatorship, Park is trying to rewrite school history textbooks. Conservatives have charged that “left-leaning” authors poisoned the current history textbooks and students’ minds with their “ideological biases.” The government has announced that they will replace the current history textbooks taught in schools with government-issued textbooks. This has been criticized as an attempt to return education to the country’s authoritarian past. In summary, Park’s promise of repeating the “Miracle on the Han River” has become a nightmare for ordinary South Koreans. As public discontent has grown, Park’s party, the ruling Saenuri Party, has lost its parliamentary majority in the general election held in April 2016. SooKyung Nam writes for the Socialist Worker , where this article first appeared.